With the advent of the internet and e-commerce websites, gone are the days where you'd have to travel to a gift shop in your locality to pick out gifts for people, be it for their anniversaries, birthdays, or any other special occasion. However, we must admit that there is no better way of picking up a gift than actually seeing it for yourself before picking it up. While it also minimises any chances of breakage or spoilage, the process of personally going to choose and buy it adds a personal touch, which is of utmost importance when gifting. What if we told you that we stumbled upon one such gift shop in Borivali that has maintained itself as is since time immemorial? 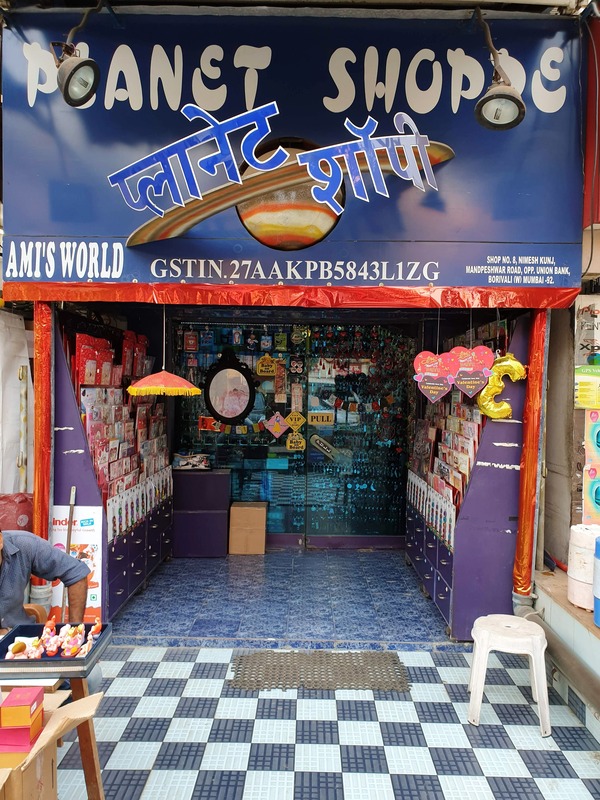 Yes, Planet Shoppe in Borivali West is a tiny gift shop that is your one-stop solution to everything gifting (when we say everything, we mean it). The outside of the shop is stacked with greeting cards (remember buying cards for your friends' birthdays) for every occasion and every type of person (best mom, best dad, world's best sibling and more) starting at only INR 50! Push open a door fully covered in keychains to enter and you will be teleported to a another planet (see what we did there) full of gift items that we wish we could gift ourselves. We found soft toys starting at INR 200, decor show pieces (INR 65-INR 2,000), perfumes (both Indian and imported brands), imitation jewellery, air diffusers and board games from your childhood (think Monopoly, Game Of Life, Jenga and many more) too. For those who love their morning dose of coffee, check out their massive collection of mugs (INR 299 upwards) lined against the wall. They also house watches of well-known brands (for those who still believe in the magic of watches over cellphones). After having seen all beautiful and colourful gift items in their neatly arranged, cosy vibe shop, we looked up only to be surprised more- a huge collection of charms, windchimes and dreamcatchers was awaiting our attention and we couldn't get our eyes off them, and we did end up picking up a nice peacock-blue dreamcatcher for INR 549. Quirky keychains in various designs and shapes start at INR 95 (who doesn't love cute keychains) here. For those who are spoilt for choice after checking out the collection and can't zero in on a single item, their chocolate gift boxes and collection of chocolates will surely get your attention. We found everything at this gorgeous shop between INR 5 and INR 5,000. Love the old-world charm and the idea of gift-picking? Head here for the perfect experience that you've been missing.